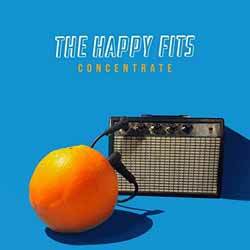 Given that The Happy Fits were originally formed to perform covers of songs they loved, it's probably not going to come as much of a surprise to discover that as diverse as their new album Concentrate is, that every now and then you'll catch a snippet of a song you already know. The album contains 11 songs (38 min, 07 sec) and takes in numerous genres from the rock-based 'Best Tears' which beautifully mixes modern rock with '60s music; folky 'Reasons for Dreaming'; up tempo rock 'Heart of a Dancer'; the 'Personal Jesus' inspired 'Mary'; and the bluesy 'Little Words'. It's an engaging and enjoyable album, although I can't see it being one that I'll be playing six months from now.